Still Seeing Aphids on Your Plants? Are you surprised to see aphids on some of your plants this time of year? With the current mild temperatures in California, aphids may continue living and reproducing in some locations this winter, with female adults giving birth to live young every day. Low to moderate numbers of aphids aren't usually damaging, but allowing them to continue reproducing on your plants may mean more aphids this spring. 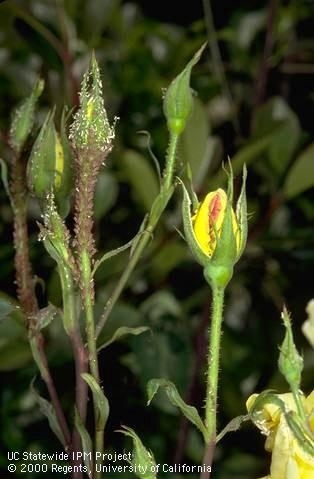 Once aphid populations explode in spring, their feeding can turn leaves yellow and stunt shoots on certain plants. Aphids can also produce a great deal of honeydew, a sticky byproduct of their feeding. For information on how to manage aphids in many situations, consult the Pest Notes: Aphids. Just found them on my English pelargonia and fuchsia. Time to knock them off with water spray!